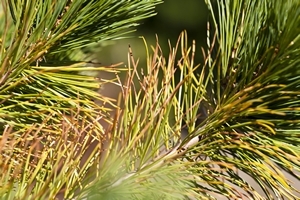 Red needle cast is a foliar disease of radiata pine caused by Phytophthora pluvialis. The disease causes defoliation, slowing tree growth rates and leading to a reduction in annual diameter increment. The disease affects tree health and could impact on commercial forest productivity. Our research has shown P. pluvialis does not pose a direct threat to New Zealand’s log trade. Extensive sampling has shown that spores only affect live foliage and do not contaminate logs. However the log trade is worth $1.7 billion per year and immediate trading bands due to biosecurity issues are a major concern to the industry. Scion views RNC research as a high priority with a focus on protecting the productivity of New Zealand’s forestry industry. Alongside this programme, Scion is also undertaking further work to develop a viable chemical control for RNC.